Travel: Where to Find Tourist Friendly Hotels, Motels, Camps, Inns, Lodging, etc. , New!!! We help you make your Poconos - Pocono Mountains NE PA choices.
. NEW! Reserve ON-LINE, get maps, information and and if you wish book over 50 of our leading hotels and resorts at discount NOW right online. CLICK HERE. Discount Coupons while you are in the area.CLICK HERE. Rate disclaimer for this page: Indicative rates for search purpose only; check for specific rate when making your online reservation. AM No 150 O N N N Y N Y A rustic get-away. 1 Lower Lakeview Dr. off Sellersview Rd. DC Y 189 Y InOut Jacuzzi Whrpl. Y Y Y Y Y Y Y Great for a honeymoon, romantic getaway, or even a wedding. AAA rated and Seal of Quality Assurance. Free Bkfst & Dinner, Sports, Tennis, Winter Sports. All inclusive Near Adventure Sports Rafting, Big Brown Fishing Reserve, Claws N Paws Wild Animal Park, etc. Travel a bit further and visit the Houdini Museum Tour & Magic Show and Mohegan Sun Casino Y Y Y ? Hotel is located in the heart of the Poconos and historic downtown Stroudsburg. An easy walk to restaurants and shopping, and minutes from major attractions. Areas served are ALLENTOWN, BETHLEHEM, SCRANTON, STROUDSBURG, WILKES BARRE, EAST STROUDSBURG, MT POCONO, LEHIGH VALLEY, POCONOS, CLARKS SUMMIT The following credit cards are accepted: AX, VI, CB, DC, CA, DS. Check in time is 15:00. Check out time is 11:00. - A full service, 134 room hotel offering luxury accomodations and facilities conveniently located near all major cities in the Northeast. Served by Scranton, Lehigh Valley, and Newark Airports. All major Pocono Attractions only minutes from the hotel. Just 75 minutes from New York and 2 hours from Philidelphia. Near Adventure Sports Rafting, Big Brown Fishing Reserve, Claws N Paws Wild Animal Park, etc. Travel a bit further and visit the Houdini Museum Tour & Magic Show and Mohegan Sun Casino AAA 3 Diamond hotel rating. Opened in 1970 and renovated 1997. There are 134 rooms on 2 floors. Time zone Eastern Standard Time. Check in time is 3 PM. Check out time is 11 AM. Airports: Newark Airport (75 miles); JFK International Airport (90 miles); Scranton Airport (50 miles)Lehigh Valley (40 miles) Area Attractions Discount ski packages during the winter months. Summertime features the Alpine Slide, nightly entertainment, Bar-B-Qs, themed events and shows. Activities include children's playpark, waterslide and daily programs for children under 12. Houdini Museum Tour & Magic Show in Scranton. . White Water Rafting and Canoeing - A choice of a calm canoe ride or thrilling whitewater on a raft. Enjoy the scenic Delaware's famous rapids, spectacular cliffs, wild flowers and crystal clear water. Day and overnight trips available. Golf Courses - With over 30 golf courses in the Pocono area, there is a course to fit all different skill levels.Outstanding scenery, shimmering lakes and cool mountain air makes the Poconos a golfer's ideal destination. Carlton Rd & Upper Swiftwater Rd. BOOK THIS NOW ONLINE Click Here. The Chateau Resort and Conference Center is located at the base of Camelback Mountain. Designed to capture all the beauty Mother Nature has to offer. The Chateau features magnificent views, cascading waterfalls and the charm of a Pocono Mountain Inn. Offering indoor/outdoor pools, jacuzzi and saunas. Skiing in the Pocono's at your doorstep and during the summer a Water Park. Near Adventure Sports Rafting, Big Brown Fishing Reserve, Claws N Paws Wild Animal Park, etc. Travel a bit further and visit the Houdini Museum Tour & Magic Show and Mohegan Sun Casino Opened in 1984 and renovated 1998. Check in time is 1500. Check out time is 1100. 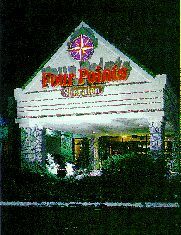 © 1993-2015 by PoconoHotels.com No part of any of this document may be reproduced in any form, without written permission. The graphics have been retouched, computer enhanced and resized by the authors. HELP WANTED! HELP WANTED! NEED VOLUNTEER HELP PROVIDING CONTENT, ETC. FOR THIS SERIES OF PAGES. GENUINE INTEREST IS THE KEY. Sales reps also needed.